Foundations of the new Rapid stadium are ready now, so it’s time to mount the stands. 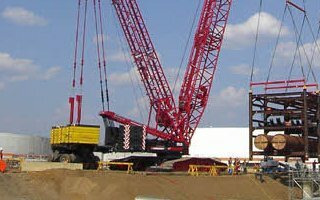 This task will be carried out by a massive crawler crane, which is to arrive tomorrow. Looking at the construction site you can’t see any remains of the old Gerhard-Hanappi-Stadion. Of course aside of the lone floodlight mast, which is to stand as monument of the previous stadium. The below aerial shows very well how the new stadium’s outline is already shaping up. Most advanced part is the east stand, where first prefabs of future stands are already in place. But largest elements will have to be installed using heavier equipment. This is why tomorrow just after dawn trucks with a 400-ton crawler crane will arrive on site. After the crane is assembled, we should see fast progress as vast majority of construction elements are prefabricated and not cast-on-site. This on one hand allows for better planning and keeping a cost-effective project. Time frame for the new 28,000-capacity Allianz Stadion envisions delivery in 2016, so from now on it’s just over a year to put the €53-million stadium together.